A 'three-in-one' online safeguarding training course written specifically for the Early Years sector, educating staff on the key areas Ofsted inspectors consider, including child protection together with online safety and the Prevent duty. A valuable tool for staff, leaders and managers who want to instil a 'culture of vigilance' in their setting. For my own use as a nursery manager I found the course to be very detailed. I will be using it for my staff. Very convenient, with a full-time job and a family I find it difficult to attend courses through face-to-face training. All info previous to assessment was useful and it was good to be able to go back in to check. Pleased with the information and resources received. What is the difference between the Safeguarding in Education and Safeguarding in Education: Early Years courses and which one should I take? The Safeguarding in Education: Early Years course has been written specifically for those working in the Early Years sector. The scenarios and information are specific to Early Years settings. If you teach in a primary or secondary environment, you should choose our Safeguarding in Education course. Is this safeguarding training suitable for all my staff? The Safeguarding in Education: Early Years course has been written specifically for those working in the Early Years sector. It is suitable for members of teaching and support staff, governors, trustees, volunteers, leaders and managers. We are based in Wales/Scotland/Northern Ireland. Can we still take this safeguarding course? 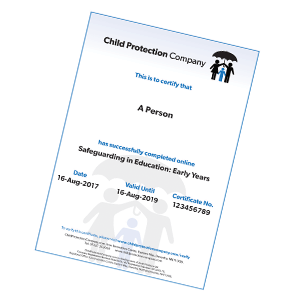 Our Safeguarding in Education: Early Years course is available with variants specifically written for England, Wales and Scotland. Please note: Northern Ireland works within a different framework, so we would advise users to contact their local authority to ask what is required in their area before purchasing this safeguarding course. This course provides an introduction to safeguarding and child protection. It focuses on a range of safeguarding issues, including abuse, radicalisation, online safety and other associated areas. The content will offer guidance on how to take action in relation to safeguarding and it is suitable for anyone working in an Early Years setting. It is a sad truth that child abuse, radicalisation, cyberbullying and child sexual exploitation are all still a common occurrence in the United Kingdom. This module will introduce you to the terminology of safeguarding and will define key words and concepts that will inform the rest of the course. By the end of the module, you will have an increased awareness of those most vulnerable to abuse, on what scale abuse occurs, and the definitions of key terms such as ‘child’ and ‘safeguarding’. Over the years, a number of pieces of legislation and guidance have been implemented to help safeguard and protect children in the United Kingdom. The purpose of this module is to help you understand what legislation is in place and why it is needed. You will not be expected to suddenly be able to quote the laws themselves, but it will help with good safeguarding practice if you have a general overview of them. It is vital that all staff understand the role of the Designated Safeguarding Lead Person (DSL) in Early Years provision, so this module also looks at their responsibilities. By the end of the module, you will have a better understanding of the main safeguarding-related legislation and guidance. You will also consider the vital role played by the Designated Safeguarding Lead Person in ensuring effective safeguarding takes place. This module will support your ability to recognise those children who are potentially at risk. You will look at what safeguarding is concerned with and this will help you to define the main kinds of child abuse. The module will then move on to consider the specific categories of abuse. This module looks at the role safeguarding should have when it comes to online safety for the Early Years. The content will give you an overview of the potential online risks for children in relation to, amongst other areas, grooming, sexting and cyberbullying. The module will remind you of the legal position should you become aware of an incident, and will outline ways of empowering children to be safe and report issues they might encounter when online. Many children are now quite digitally aware from an early age, and the sooner the safeguarding process starts the better. All Early Years settings have a legal duty to prevent children from exposure to extremism. This module places the Prevent strategy in the context of the Early Years environment and considers the ways in which radicalisation can affect a child and the groups that may attempt to induct a young person into their ideology. By the end of the module, you will have a greater understanding of the signs of radicalisation and what to do should you feel a child is in danger under the Prevent strategy. At the end of this module, you will have a better understanding of the signs of physical, emotional and sexual abuse, and neglect. You will also have an outline of the professional responsibilities expected of Early Years Workers. The focus when working on safeguarding or dealing with a potential abuse scenario must be the safety of the child. Maintaining a child focus is key to the process of identification & reporting, because statistically, it is sadly the case that children sometimes report several times before any action is taken. The learning you complete in this module will be contextualised in a realistic situation so that you can see how being ‘child focused’ can be achieved. By the end of this module, you will have a better understanding of what it means to be child-centred in your approach, as well as the responsibilities of those who work in the Early Years in relation to documenting decisions made. By the end of this module, you will have a better understanding of the correct procedures to follow in response to a potential abuse situation and what to do if you have concerns about the behaviour of an adult. A step-by-step guide is included, which will help you refer any concerns you may have. You will now take all that you have learned and apply it to an assessment of your knowledge. The final assessment is your opportunity to show how much you have absorbed and why it is so important to have child protection training.